As with every year in the valley, there are varied observances for Veterans Day in the community. Selwyn Harris/Pahrump Valley Times Area veterans salute the flag during a previous Veterans Day observance in the Pahrump Valley. Ceremonies are once gain planned this Saturday and Sunday at various locations, honoring those who have served. Once such event, on Saturday, Nov. 10, will be held at the G.I. USA store at 150 South Highway 160, unit A-4, just a few yards from the north-side entrance of Albertsons supermarket. The 11 a.m. to 2 p.m., observation is a perennial favorite among area veterans and the community at large, judging from past Veterans Day events. Owners George and Cindi Vroenen have arranged for free entertainment and raffle prizes for a few lucky attendees, along with free food for veterans. Also on Saturday, Nov. 10, members of the Pahrump Valley High School’s music department are hosting a veterans concert. Admission to the 2 p.m. event is a few canned food items. For attendees, raffle tickets, tacos and authentic Mexican horchatas will be up for sale. All proceeds benefit the school’s music department. 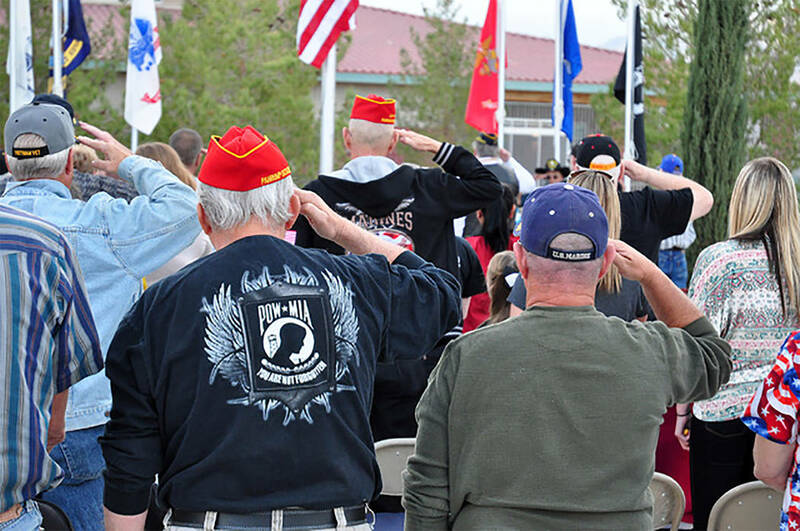 As both Saturday events precede Nov. 11, which is the actual Veterans Day date, members of the Pahrump Marine Corps League are hosting its official Veterans Day observance at the Pahrump Veterans Memorial at Chief Tecopa Cemetery on Sunday. The site is located adjacent to the Pahrump Community Library, 701 East St. Organizer Jose Telles said the 11 a.m. special service will include a dog tag placing ceremony, a presentation of colors and an opening prayer. Telles began his military career back in 1953 when he enlisted in the Marines. He retired in 1978, after serving two tours in Vietnam. The Veterans of Foreign Wars Post #10054 will also host a Veterans Day ceremony on Sunday, Nov. 11 at 11 a.m. at the post, 4651 Homestead Road. Later that evening, the Disabled American Veterans Chapter #15 will host a Veterans Day Sundown Service at the Chief Tecopa Cemetery Veterans Memorial, on East Street next to the Pahrump Community Library. Both events are open to the entire community. Reporter Robin Hebrock contributed to this story. Contact reporter Selwyn Harris at sharris@pvtimes.com. Follow @sharrispvt on Twitter.